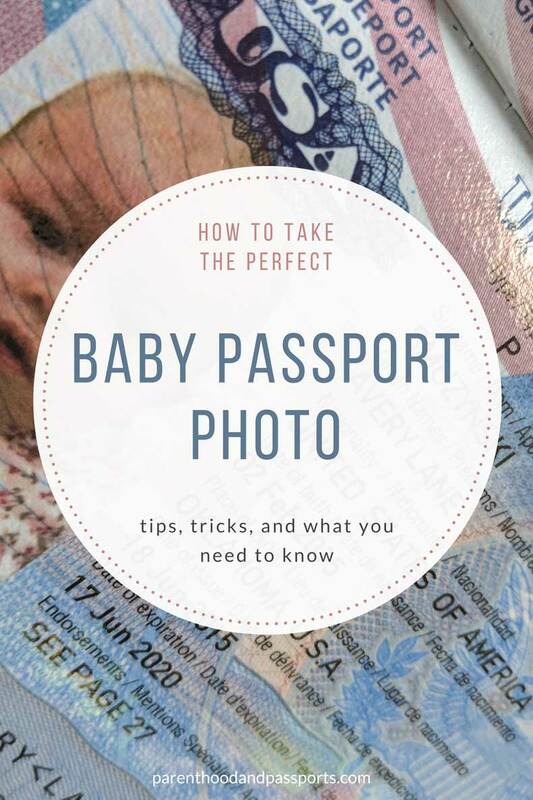 Taking a passport photo for a baby is fairly simple, yet so many of us are afraid to attempt it ourselves. If you plan to travel internationally with your children, they need passports regardless of their age. 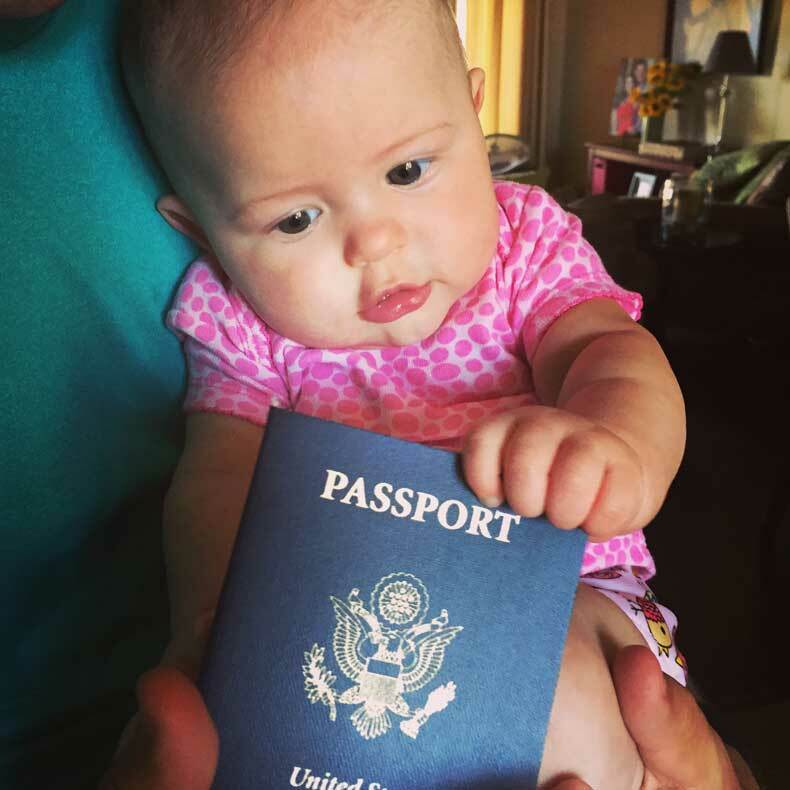 Our daughter got her first passport at three-months-old, prior to her first international trip to Costa Rica. Unfortunately, we failed in the baby passport photo department. Like many parents, we questioned our ability to take a photo that met all the government guidelines, and ended up getting it taken elsewhere. In retrospect, it would have been easier and the outcome would have been better had we taken the photo ourselves. Our passport photo fail: Baby passport photo or mugshot? Wanted: female infant, 26 inches tall, 12 pounds, brown eyes, and very little hair. Offense: refusing to smile in passport photo. Soon-to-be armed with a potentially explosive poop. That should probably be how the description reads inside our daughter’s passport. I think my kid is the cutest baby in the world, but her passport picture doesn’t necessarily reflect that. For one, she wasn’t having the best day. I’m not sure what 3-month-olds have to be cranky about, but cranky she was. And she absolutely refused to smile. Since we were planning an international trip, I had only a couple of months to submit the necessary paperwork and photos for our baby’s first passport. She could hold her head up decently at that age, but could not yet sit on her own. Unfortunately, passport guidelines require that no other person, not even their hands, can be in a passport photo. So there I was in a corner drugstore chain, holding my baby with awkwardly out-stretched arms trying to keep both my body and my hands out of the shot. Apparently, the teenage clerk with the point-and-shoot camera didn’t care that my sweet girl is infinitely cuter when she smiles. He made no attempt to make her giggle or smile before the photo was snapped. So, the end result was a baby who looks mildly terrified, confused, and uncomfortable. In all reality, I don’t think the picture is as bad as I jokingly tell the story. But I did learn a few lessons from my experience. If I had it to do over again, I guarantee my baby’s passport photo would have turned out a lot better if I would have taken the picture myself at home. 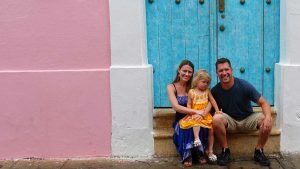 TRAVELING INTERNATIONALLY WITH YOUR INFANT? CHECK OUT THESE TIPS TO HELP YOUR BABY OVERCOME JET LAG. If you need a baby passport photo, it’s likely easier to do at home than you would probably think. 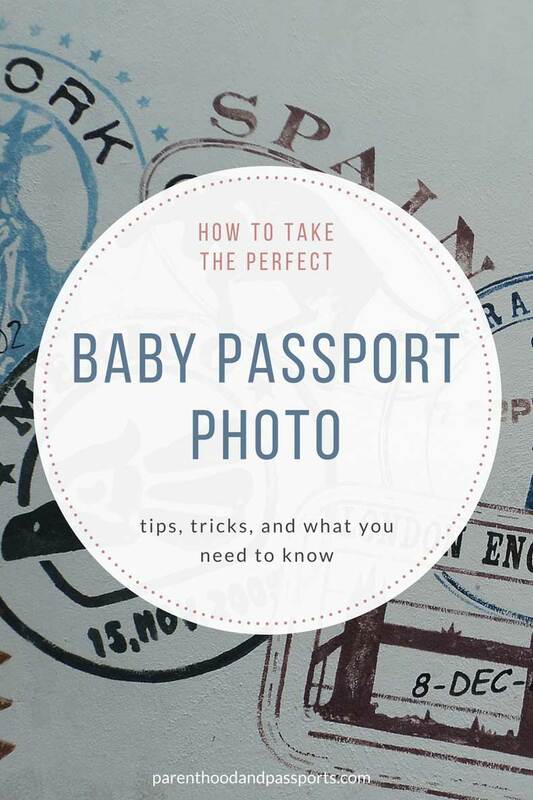 Here are a few tips and instructions to help you through the process of taking the perfect passport photo for a baby! -Lay your baby on the floor on a non-textured white sheet or white posterboard. A textured blanket will result in a passport photo rejection. The first two images below are blankets. The third is a pressed, white sheet, pulled tightly. -Take the photo from overhead. This way you do not have to worry about holding them up. If you take the photo yourself, you can take as many as you want and choose the best one. -Your baby head must be facing directly at the camera. In a baby passport photo, the head can not be tilted or turned even slightly to the side. -Your baby’s eyes must be open in the photo. -Make sure you have adequate lighting. Natural light is always best. If you must use a flash make sure it is not casting shadows. There cannot be any shadows cast on your baby’s face or around your baby’s head. –Read the rules ahead of time. No hats, bows, or glasses are allowed in the photo. -Crop the photo to the right size using the Department of State’s passport cropping tool then print two copies at home on a colored printer or get it printed out professionally. 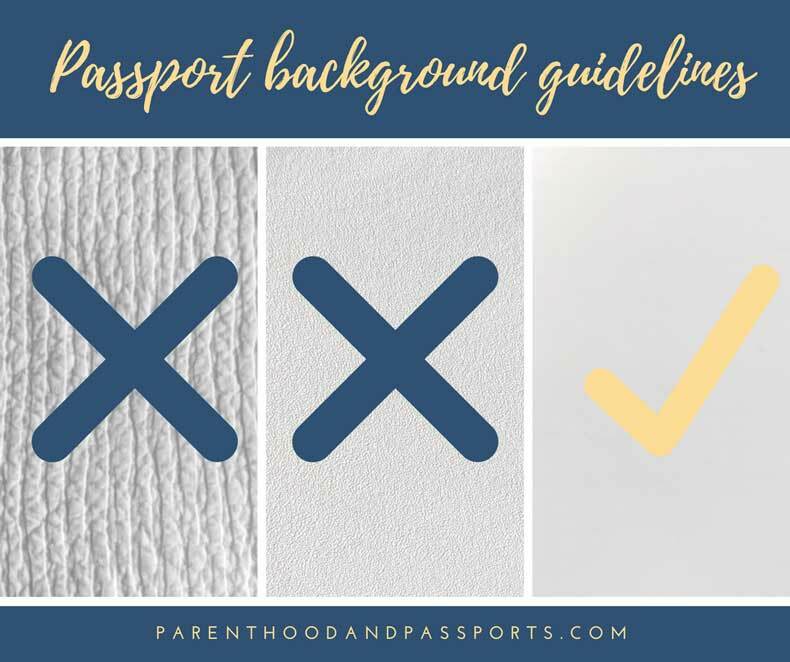 -Finally, make sure you submit your passport paperwork and baby passport photo plenty of time in advance before your trip – just in case there is an issue and you need to redo it. In the first photo her head is tilted. That would not work for a passport photo. You’ll also notice wrinkles in the white sheet behind her. 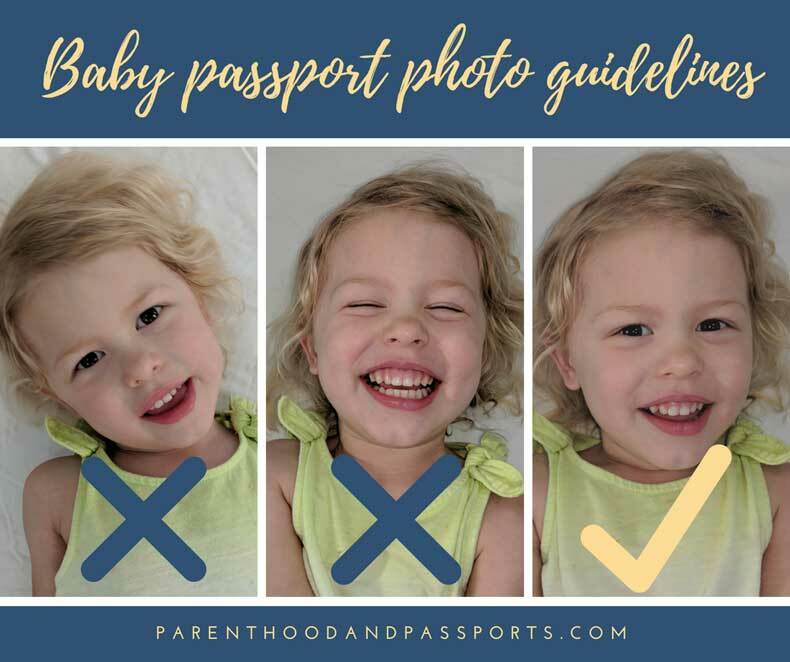 In the second photo, her eyes are closed, and while her smile is adorable, for a passport photo, they require a more natural expression. Finally the third photo would be acceptable. She’s looking straight at the camera, with a natural expression and a clean, pressed white background. If you still don’t trust yourself, take someone else with you to whatever passport photo station you choose to visit. The other person can hold the baby or stand behind the camera to get a natural smile or at least some type of expression. Taking a baby passport photo really doesn’t require a lot of effort or time. In fact, doing it yourself will save you money and stress. And hopefully, you’ll get a great photo that will make even the most serious of customs agent smile just a little. 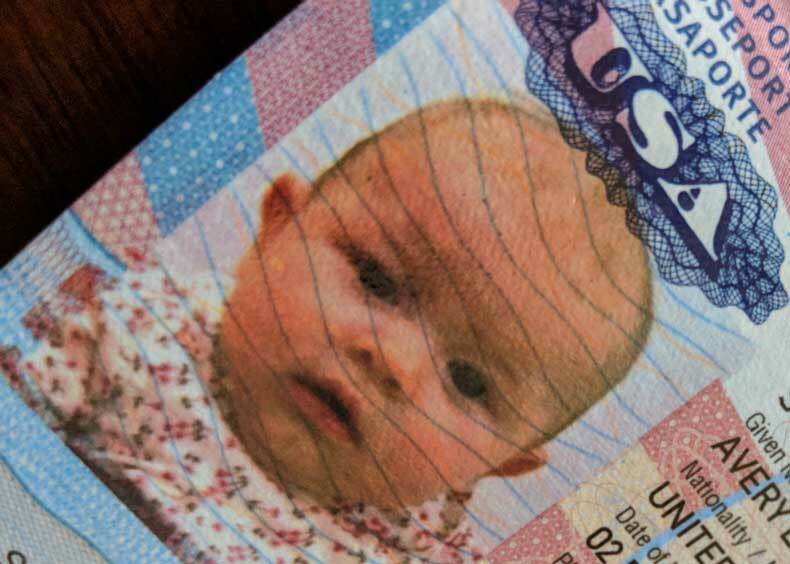 Did you take your baby’s passport photo at home? How did it go? Let us know in the comments below! Her Mimi and Poppie think so too! I can see why you would want to do yourself. It hard when my husband and I got our passport pictures made. Yes, I took a passport photo of my 2 year old’s and prepared it for application in Passport Photo Maker – crop, make it sharper and brighter, etc. What’s good in taking baby passport photos at home, none gets stressful, and you just can choose the best photo, edit it and then print. Stress free and getting to choose the best photo makes it so worth it! !